The histogram is most scientists’ tool of choice for viewing the distribution of values of a single variable. But lately I have been exploring an alternative: quantiles (e.g. deciles, percentiles, etc). Although viewing data in this way is not perfect, it has several advantages to histograms, including robustness to outliers and a freedom from apriori assumptions about the range or smoothing level of the data. This post has some code written in Python. If you don’t have it already, you may want to follow along by installing Jupyter and opening up a notebook. We’ll begin by inventing an unusual probability distribution with characteristics that will highlight some problems with histograms. We’ll choose a cumulative distribution function (CDF), probability density function (PDF), and inverse CDF that are easy to evaluate analytically. The distribution will be jagged, bimodal, and have a small a blocky sidebands to represent outliers. Understanding the python code used to produce artificial data is not essential to understand the rest of this article, but the basic trick used in the following code is to pick random points on the Y axis between 0 and 1, draw a horizontal line over to where it intersects the cumulative density function, and then use the intersection’s X coordinate as your random sample. You can easily produce samples from any distribution with this technique. '''Returns the probability density function of an unusual distribution. '''Returns the inverse cumulative density function of an unusual distribution. We won’t need to show the CDF again – it was merely a visual guide to help see how to generate samples from the distribution. Histograms require assumptions about the range of a the distribution. Histograms usually require that you choose a minimum, maximum, and number of bins with which to tile that range. When one don’t know a priori the min and max, it is common to use the limits of the sampled data, specify the number of bins, and then calculate the bin edges automatically. Unfortunately, this means that it is almost guaranteed that two sets of sampled data, even from the same distribution, will have different bin boundaries. In the above figure, you’ll note that the bin widths for A and B are different, because in sample set B, there were no points sampled around . Histograms are hard to combine or build incrementally. Let’s pretend A is your existing estimate of the distribution, and B is a new batch of data that just came in. 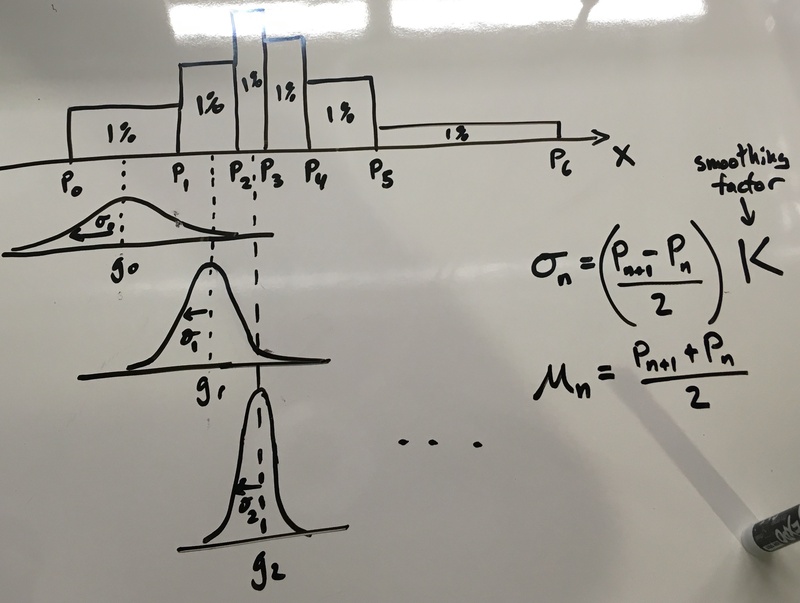 Furthermore, let’s imagine that you don’t want to recompute your histogram from scratch, but want to combine the histograms of A and B to produce a new histogram. How would you combine two histograms that have different bin widths and numbers of bins? While possible, I hope you can see that it would be awkward and leaves much to be desired. Histograms obscure the shape of the data when there are large outliers. For illustration purposes, the little “sideband” around is not that far from the main distribution. But you can imagine that if those outliers were at , and keeping the number of bins fixed at num_bins=30, the range of the data would be so large that almost all of the data would fall in the first bin, and all others would be zero. Relatedly, when you have lots of data in a single bin, you should theoretically be able to infer more about the internal structure of that bin. Unfortunately, when using a histogram, one can never resolve anything finer than a bin width. Another, more subtle problem that we won’t get into today is that a histogram has a varying number of data points per bin. This means that your error bars (or confidence interval) on each bin will have different magnitudes. It is disappointingly rare for error bars on histograms to be plotted – but without error bars, it’s not science! We will now explore using quantiles to represent the sampled distribution, and see how that differs from the histogram representation. For those of you who have forgotten what a “quantile” is, it is just a generalization of the concept of a percentile. The basic concept of quantiles is to sort some data by value, and then sequentially group sorted data into equal-size groups. When points, we call them “deciles”. When , we call them percentiles. A list of percentiles of family income would give us 101 numbers (from 0% to 100%). The 0th percentile would be the lowest income, the 50th percentile would be the median, and the 100th percentile would indicate the maximum family income in the data set. Let’s see how you could use the percentiles to generate a histogram-like plot. To make the comparison between histograms and quantiles fair, we will use the same number of quantiles as we did histogram bins. # To plot the percentiles as a histogram, we need to take the "derivative"
There appears to be more inaccuracy between the Quantile PDF and the true PDF than with the histogram around the area. We’ll discuss whether this is really true or not in a moment. Rather than break up the estimate of the PDF into equal bin-widths on the X axis as the histogram did, the quantile-based estimate of the PDF divides the probability mass into equal-area rectangles that are squished and squashed to be short and wide or tall and thin. Around there is a short and wide bin, and around there are very tall and narrow rectangles. The quantile representation assumes that the distribution is continuous, so the “outliers” on the far right have now been spread out over the whole range . It ends up predicting such a low value that it is not very visible on this plot, but it is nonzero. Point two is most important factor to keep in mind. With histograms, we give each bin an equal amount of information, regardless of how many points fall into it. With quantiles, we give each fraction of data the same amount of information, which is then spread out. We noted earlier that histograms generally sideline the issue of uncertainty in each bin estimate. We have done the same with the quantile technique here – while we have faithfully represented the probability mass of the samples, this may not produce a very good visual estimate of the PDF. Can we make it look better? # to half the distance betwneen the two quantiles, scaled by smoothing factor K.
This approach to smoothing is intuitively attractive, and to my eye the K=3 smoothing level looks very pleasant. Using is basically expressing that we have some measurement uncertainty of our ’s that we would like smoothed out. But have we really accounted solved the right problem? While we know exactly the quantiles of the sampled data, we have uncertainty about the true quantiles. What if, instead of using a gaussian smoothing kernel, we computed our uncertainty on our estimates of the percentiles and generated an estimate based on that, instead? That looks nicer to my eye. Let us now imagine that we now want to combine samples A and samples B into a new estimate. How would you achieve this? Take the (weighted) mean of all the estimated PDFs. Combine each set of quantiles into a single set of quantiles. Apologies for the busy plot, but there’s a lot to see here, and it may be worth studying further. I’m not sure which combination method should be used in general – it may depend on your application. What happens as you get more data? Rather than do much math on this one, let us simply keep the number of histogram bins and quantiles constant at 50, increase the number of data points, and see what happens. What happens if we try fewer and fewer bins? I haven’t tried making confidence intervals for the histogram yet, but my guess is that we could express uncertainty by taking a lot of bootstraps, generate many CDFs, and then taking the top 95% or bottom 5% value at each X coordinate. The difference between the histogram and quantile technique is primarily in how information is used. In histograms, we give each bin an equal amount of information (i.e. one number per bin), regardless of how many points fall into it. In quantiles, we give each fraction of data the same amount of information (i.e. about one number per percentile). It better captures the structure of the distribution better in high density areas. It can help reduce the visual effect of outliers. It cannot represent truly disconnected distributions. Visually, even though it is technically better it can be misleading – the relatively higher density of control points compared to the histogram means that quantile-based estimates of the PDF can have more visible variation. If this looks correct to y’all, then perhaps we could convert this code into a class or library that could be easily packaged and re-used by others?